Who knew that an ice cream sandwich could be so elegant and delicious! This is an easy make ahead dessert for a dinner party. Just assemble right before serving. The blackberries will need to be warmed in the microwave if serving in this manner. Ingredient amounts will make 4 servings as shown. Whisk together the water, cornstarch, melted butter and sugar in a medium sized bowl. Add blackberries and gently toss until evenly coated. Place into a medium sized baking dish sprayed with non-stick cooking spray. Place into a preheated oven at 375 degrees for 30 minutes. While blackberries are baking combine the wafer ingredients in a small mixing bowl. Blend together and ladle 8 equal amount of the mixture onto a large cookie sheet sprayed with non-stick cooking spray. Leave enough space between each amount because they will spread a bit while baking. Place into a preheated oven at 375 degrees and bake for about 10 minutes until golden brown or even a bit darker. Remove, let cool and sprinkle with powder sugar. 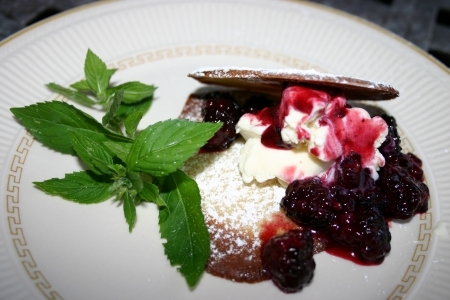 Once ready to serve place one wafer on the bottom of each of your serving dishes, place a scoop of vanilla ice cream on top, add a couple of tablespoons of the warm blackberry compote over each scoop of vanilla, top with a wafer and garnish each plate with a sprig or two of mint.